I had a block printed material in medium beige colour.I also bought a same combination on duppatta too. For this , a maroon tunic was bought and designed, then the tunic was given away, may be, because, it became too tight! I found this double colour-peach and beige- fabric. This tunic, being the second choice, needed to be simple. I had some dark brown [wooden]beads. After the tunic was sewn, I did a row of cross stitches in maroon and brown. Then the beads were attached to the space in between. Small straight stitches were worked , spurting away from the beads. 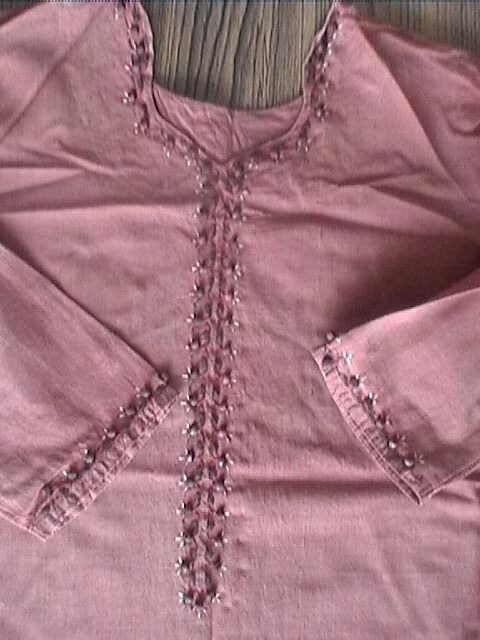 I wore this for some years , then the pants were discarded, the duppatta waited to be made into a tunic!